There is more misinformation and disinformation regarding air filters and air filtration than the amount of misinformation in the Enron case. This is due, unfortunately, in part to the great amount of marketing and hype that is given to so many different types of air filtering devices and mechanisms. The problem is that marketing and hype are not substitutes for physics…That’s right! Physics….the factual, technical way something actually performs. So, if you don’t read any other section in this university, make sure you read this one. Mechanical air filters remove dust by capturing it on the filter medium, the material that makes up the filter element. A mechanical air filter is any type of dry media filter. All of the throwaway air filters used in HVAC systems and Air Handlers are mechanical air filters. Any man made or natural fiber filter is a mechanical air filter. This includes HEPA air filters as well. The three-filter sketches represent a standard throw away air filter (A1 & A2) usually 1′ thick. B represents a 2″ or 4″ thick pleated media air filter and C represents a HEPA air filter, usually 11 1/2″ thick or deep. Mechanical air filters operate on two filtration principals, primary air filtration or impingement of the dust on the media itself, and secondary air filtration which is the dust or filter cake on the filter removing or filtering out smaller dust particles. Figure A1 shows the air filter when it is first installed. Most of the air filtration takes place in the media itself. Figure A2 shows the air filter with dust on the media and the particle reduction efficiency gets better as the filter loads up. All mechanical air filters operate in this manner. For additional information on mechanical air filtration, click here. I will try to keep this simple and short so as not to add to some of the confusion over air filter efficiencies. First, I would like to point out that any company that sells an air filter that states an efficiency rating without basing it on a particle size is providing you with basically useless information. For example: an air filter that has a statement reading “this filter will remove up to 95% of all airborne contaminants in your home or office“, doesn’t really tell you anything. Since most of the respirable particles that actually are harmful are usually less than 2 microns in size, don’t you think it would be important to tell you what size particles they actually remove from the air? So, let’s look at this statement again. “95% of all airborne contaminants” sounds pretty good, doesn’t it? Our HEPA air filters remove 99.97% of all airborne contaminants at 0.3 microns and smaller. At first glance these two air filters look similar in capability. But the first air filter provides no particle size range or efficiency based on particle size. On the page below you will see the new MERV ratings. This MERV rating chart has the MERV ratings, 1-16 on the left hand column and then there are five other columns showing the average efficiency in microns, average arrestance and the final resistance as measured in inches of water. Most companies that make air filters are now using this MERV rating, so you will see a MERV number on the air filter and perhaps some rated efficiency. MERV Ratings for Electronic Air Cleaners, Electrostatic Air Filters and HEPA Air Filters. The MERV ratings really don’t apply to the Electronic Air Cleaners, as these are not Mechanical Air Filters. Electronic Air Cleaners use a series of wires in a grid form that are electrically charged. These charged wires (or plates in some units) attract the particles being drawn in by the heating / cooling fan. There is no media for which the particles can be trapped and no additional dust cake for continued air filtration efficiency. Every time the wires or plates are charged they loosen some of the particles that are attached. And, as the wires become coated the efficiency of the Electronic Air Cleaner system is reduced. In fact, Electronic Air Cleaners are the only air filtering device that becomes less efficient as it loads up. Its efficiency can start out as a MERV 12 but drop down to a MERV 8 rating within one week of operation. As a result of their type of performance, they do not use a MERV rating. Electronic Air Cleaners units need to be cleaned frequently to maintain good efficiency. Electrostatic air filters are made by a number of companies and these can be purchased in most hardware stores. The typical electrostatic air filter is made from polyester or polypropylene strands that are supposedly charged as the air passes through them. These air filters are often rated as 95% plus efficiency on the Arrestance scale. Arrestance is NOT efficiency. It is the percent of weight, in grams of dust, that the Electrostatic Air filter can hold before it loads up completely. These filters are actually about 18% on the ASHRAE scale and may have a MERV 4 rating. They usually have a metal frame and do not fit tightly into the air filter frame. A highly over rated air filter type. The only advantage of Electrostatic air filters is that you don’t have to change them, just wash them off. air filters are not MERV rated as they exceed the ASHRAE test protocol 52.2 used in determining the MERV ratings. In fact, HEPA air filters are the ONLY mechanical air filters that are tested and certified to meet a specific efficiency at a specific particle size. All HEPA air filters must meet a minimum efficiency of 99.97% at 0.3 microns. ASHRAE or MERV air filters are tested using the Dust Spot tests that incorporate some fine dust, powdered carbon and some cotton linters. The Dust Spot test particle size range is from .3 microns to 50 microns in size with an average size of approximately 20 microns in size. HEPA air filters are tested using DOP, Mineral Oil and other materials that generate a mono-dispersed particle that are all .3 microns or smaller in size. In essence, if 10,000 .3 micron sized particles are blown into a HEPA air filter, only 3 particles are allowed to pass through. Thus, you get the 99.97% at .3 micron rating. 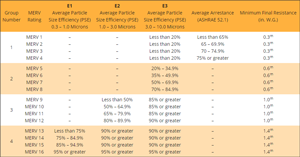 If you were to use the HEPA test on a 95% ASHRAE air filter they would be about 50% efficient on .3 micron sized particles once they loaded up with dust. So, HEPA air filters are at least 50% more effective at removing respirable sized airborne particles than any of the ASHRAE air filters on the market. Pure Air Systems, Inc. has always taken a somewhat negative position in the use of Ozone for anything other than remediation. Ozone, or O3 is a strong oxidizer. Ozone easily gives up one of its Oxygen elements and can alter the chemical composition of gases. It has little or no effect on solid particles although it may halt the growth of mold and bacteria when used in high concentrations. Ozone is often referred to as “energized oxygen” or “pure air” suggesting that ozone is a healthy kind of oxygen. Ozone is a toxic gas with vastly different chemical and toxicological properties from oxygen. Ozone can be harmful to the respiratory system and is the primary component of smog. Both the United States Environmental Protection Agency and Health Canada, the Ministry of Health for all of Canada do not approve Ozone generators for use in occupied space. It should be noted, that most people that sell Ozone generators have little knowledge in the proper application of this technology and most often do not understand the health implications of using ozone in an occupied space as a continuous air-cleaning device. Ultra Violet lights (germicidal lamps) or UV systems come in both a hot (8,000 hours life) and cold plasma (rate 36,000 hours life) lamp systems. They produce a specific wavelength of 253 nanometers and produce UV C. This wavelength has the ability to affect microbiological contaminants like mold and bacteria. The UV C light can destroy the DNA of the microbiological and keep it from replicating. UV C has no effect on solid particles and it does NOT remove anything from the air stream. UV C lights are normally placed in the return air stream, although the speed of the air past the lights can minimize the effectiveness of the UV lights. We suggest that placing a UV light at or near the cooling coils works better as the light can irradiate this moist area all the time and help in minimizing the growth of mold or bacteria. UV lights are an ancillary piece of equipment and should always be used in conjunction with an air filter or air filtration system. These devices produce negative ions that charge the particles in the air. The charged particles then attach themselves to any positive surface area. This could be a wall, floor, furniture, ceiling, etc. Once the particles lose their charge, they are back in the air again. This is not a particle removal system. Ion generators only work well when used in conjunction with an air filter. Okay, so you’ve heard about pressure drop or static pressure or resistance as it relates to air filters or perhaps even duct work. Well…..listen up. Static pressure or resistance affects EVERYTHING in air handling. It is the ONE variable that dictates the design and performance of any air moving device and the air filters that are used in those devices. Simply stated, pressure drop or static pressure is the amount of resistance as measured in inches of water (w.g. ), that is produced when air is moved through an air filter, an air duct or any device that can impede the air flow and cause resistance. For example, we have just looked at the MERV ratings of the various filters. The last table of the chart on page 8 shows the minimum final resistance in W.G. for the various filters. These numbers are in inches, so the first group of four (MERV 1-4) show 0.3″ final resistance. This is based on a flow rate of 500 feet per minute through the filter, which is what the filters are actually designed to meet for both optimum efficiency and pressure drop. The higher the pressure drop, the more energy it takes to move air through the filter. The drawings below will hopefully show you the relationship. Think of pressure drop or static pressure as resistance. Imagine walking along on a level surface, walking in a normal pace. Minimal energy is used to keep walking. Now, let’s tie a line around your waist and put a 10 lb weight at the end of the line. In order to maintain the same pace you may have to use a little more energy. Let’s assume each 10 lbs is equal to .1″ of an inch of static pressure or resistance. Now let’s add another 10 lbs for a total of 20 lbs of weight or .2″ of resistance. It takes a little more energy to maintain the same pace. As we add more weight it becomes more challenging to pull the added weight and still maintain the same pace. If we add enough weight you will not be able to maintain the same pace and you will eventually slow down or even stop. The only other way to keep moving is to add another person. This is how static pressure affects the fan/motor assembly that moves air in the HVAC system or any air- moving device. As the static pressure increases the horsepower of the fan motor is being used up. At some point, the static pressure will be higher than the motor can handle to maintain the same airflow and it will slow down (back down) or even stop unless more horsepower is added to the motor. You should know, that most heating / cooling systems in the residential and light commercial markets are designed to move 900 CFM to 2000 CFM at a total system static pressure of approximately .5″ to .7″ total pressure drop including the resistance through the ductwork and the filter. So, if you put a filter with a higher resistance in the unit than the motor horsepower can handle, you will slow down the heating / cooling blower / motor and reduce the overall effectiveness of the system. This is why all the filters that come with heating / cooling systems as original equipment are the least efficient, low resistance filters. There is a relationship between filter efficiency and pressure drop and resistance. As you can see from the MERV chart on page 8, as the filters become more efficient (higher (MERV ratings) the final resistance becomes greater. We will cover more information regarding the effect that filters have on air handlers in the next section (“HVAC” – Heating Ventilation & Air Conditioning). Simply stated, gas phase adsorption is the process of using an adsorption media like carbon, to adsorb gases and odors in an air stream. Carbon and other adsorptive medias do not filter out any particles, they are only designed to remove or reduce the levels of gases and odors. Often carbon or other adsorptive medias are used in conjunction with air filtration as a combination filter/odor adsorber system. The HEPA Shield systems that we offer use carbon as one of the three filters in the units. It is also essential that some form of prefiltration be used to keep the carbon or other media from collecting too much dust. Gas phase adsorption is used most often in commercial and industrial applications where a specific type of gas needs to be removed or reduced. Adsorption works better when the bed depth of the particular adsorber is thicker or deeper. The deeper the bed the longer the residence time or time in which the adsorptive media is in contact with the gas. Carbon units have a relatively high pressure drop or resistance so only the thinner 1″and 2″ carbon filters are used in air handlers. Higher capacity carbon systems require independent fan/motor systems to pull the air through the higher static units. You should always check the static load capabilities of the air handler or heating/cooling fan prior to installing any carbon filter. Carbon and other adsorptive medias have a minimum life. They can adsorb 33% to 50% of their weight in gases. If you have a 15 lb carbon filter and you generate 1 lb of gas per week, the filter will last 15 weeks. Pure Air Systems, Inc. offers a line of Odor Absorber systems or OA units that have all carbon or other absorptive medias. These OA units are identical to the HEPA Shield systems in that all we do is remove the HEPA filter and insert carbon media in its place. Page 11 shows the OA units and their carbon/adsorptive media capacities.